Particularly for someone promoting the benefits of focused simplicity and efficiency to entrepreneurial businesses, a cluttered website sends precisely the wrong message. 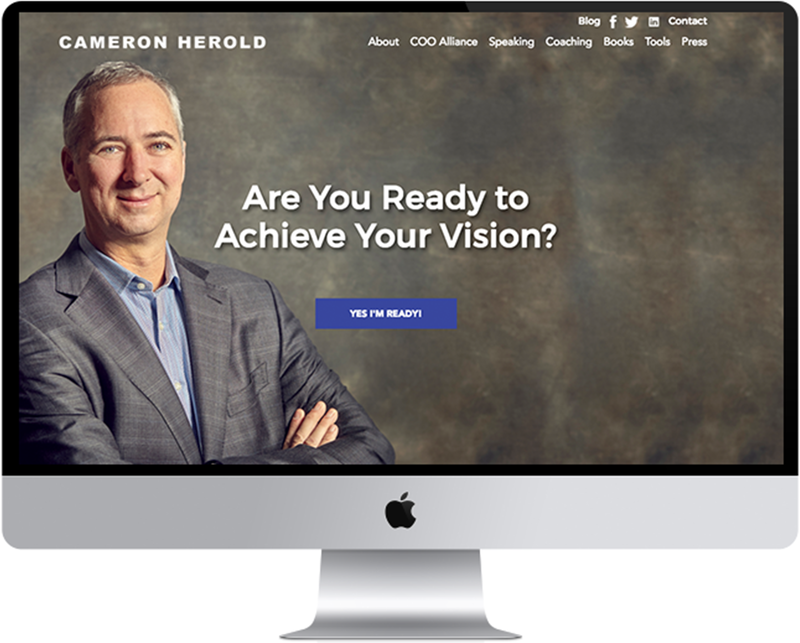 Cameron Herold had developed proven organizational and motivational techniques that burgeoning new companies needed to flourish and grow but his online presence was wildly outdated, convoluted, and ultimately, ineffective. He needed a site that matched his cutting-edge methodology with a forward-thinking interface and design. A cleaner, bolder, re-designed website provided the perfect reflection of Cameron’s overarching philosophy —his "why"— that simple solutions coupled with a broader perspective are the essential tools for businesses looking to manage expansion and change. By undertaking a full revision his graphics, photos, copy, and user interface to align with his message, Cameron’s site was transformed from a mere menu listing of services into a vibrant, active brand ambassador that captures the imagination of potential new clientele and the essence of what Cameron has to offer to their companies.